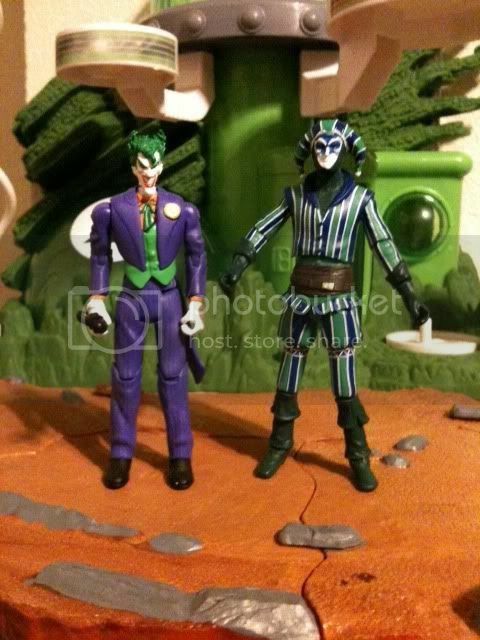 I found the BTBAB Joker in the Blue suit and the TBM Joker with the more traditional outfit. I also saw the Hero World Joker but am reluctant to pay the price for him. I like the version of him with the funny car better but the the price goes up exponentially. I feel I may cave on that though. 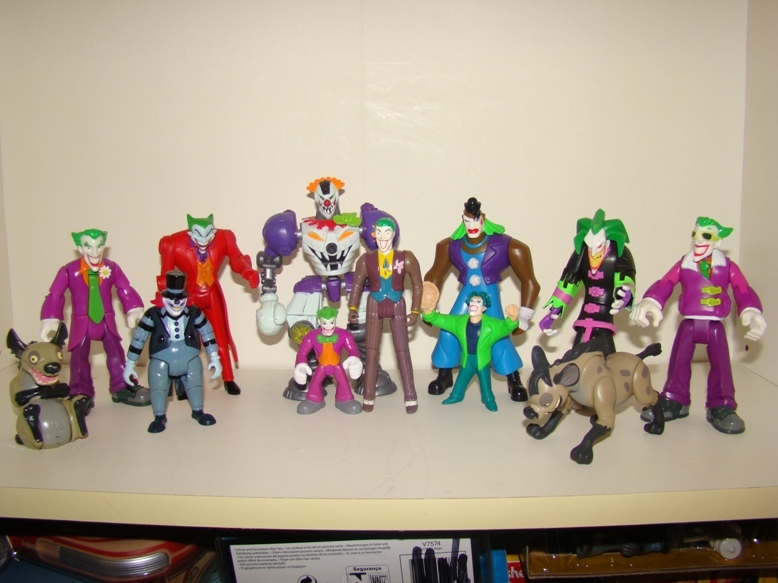 I'm reluctant to open any of my Animated Batman Jokers. I think they may be too out of proportion. Still looking for the Krypto the Superdog, Ace the Bathound Hyenas. Ya the scale may be off, but I want them anyways. My Harely Quinn will be staying in her package. I'll have to see if I can find her loose on E-Bay. From some one that doesn't charge $21.00 to shipp a .99 cent action figure. I don't think I've ever seen that Robo-clown before. That thing is spooky, but fits in great. Of all the Rock 'em Sock 'em Robots action figures, this one is about the only one that works. Plus he came with some cool accessories lie a pie that shoots from his hand and a Joker in the box. Has anyone seen the Bathound and Hyenas from Kryto the Superdog series? Are they THAT much larger that they wouldn't work scale wise? Thanks Stewbacca! I appreciate that. I picked up the batmobile from that series for a rediculously low price. Figured I could modify it for the 5in figures. Sorry for the delay in replying. Working with my editor chews up free time but the end result will hopefully mean being published... finally. Still whimbling on the Dark Knight movie Joker. I would love to eventually see a Joker's Gally of assorted henchmen produced. Jokerz, Royal Flush Gang, Curly, Larry and Moe, Punch and Judy etc. But I dont think ACE will fit in with any line other than his own..
And I think you're right, they would fit ok. That's what I was hoping for. Close enough. Ace wasn't even in consideration, at least not from that series. On a side note, if anyone is looking to sell the Bud and Lou Hyenas from the Kyrypto the Superdog series, drop me a line. Assassin's Creed has a nice Harlequin figure, in 4" scale if you aren't picky. Oooo... he's pretty cool! I didn't even know they made action figures for Assassin's Creed. If only they made 4-5" Twisted Metal figures. Sweet Tooth would be a great figure as well as a great base for other figures. Chucko etc. The spawn figures are too... over detailed to fit though. I just did a Google for clown action figures. I saw 7" Insane Clown Posse figures from Neca. Updated with new additions. Not sure about the Disney Hyenas, but they'll have to do until I can find suitable replacements. Playmobil has a set that I've been eyeballing. Is that the brand you saw? It needs to have that appropriate "toon" or Bruce Timm style to them. Still pining for the hyenas from the Krypto the Superdog series. Definitely not paying what they are going for.